Sugar, ALMOND, cocoa BUTTER, cocoa mass, WHEY, MILK, LACTOSE, SOY LECITHIN, vanillin, glazing agent: E414.May contain traces of PEANUTS. Already slightly sweet almonds get an even more intensive aroma through the tenderness an wonderful layer - not too thick and not too thin - of whole milk chocolate. It's as if we put the latter on top of our best almonds just to preserve all their flavoury and healthy qualities. Combined, our CHOCO MILKY ALMONDS taste incredibly yummy! Almonds and chocolate - an unbeatable flavour combination! 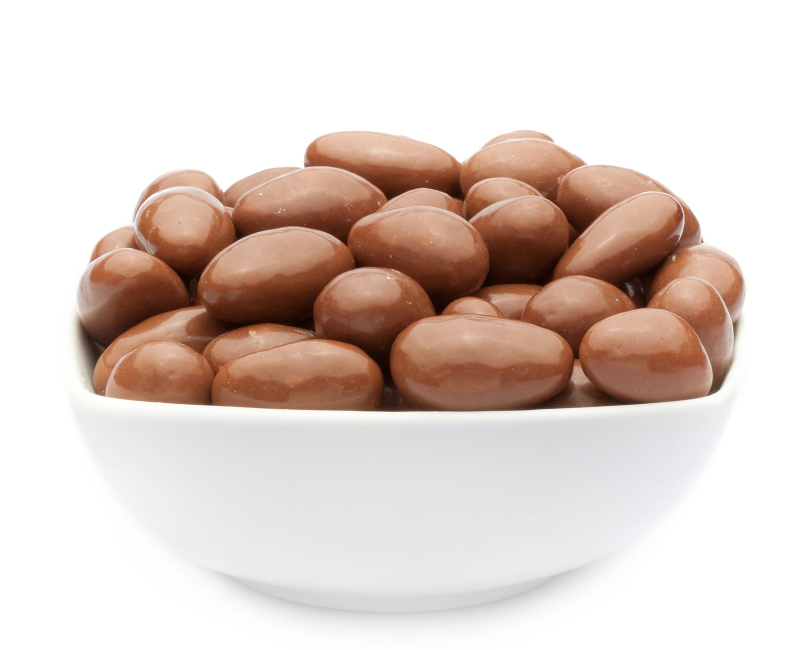 For all those who swear by nuts with chocolate coating, our CHOCO MILKY ALMONDS are a sin that simply has to be commited! Drawn by its shine that beautifully refracts light and the fine scent of high quality whole milk chocolate, these delicacies simply take the cake when it comes to tasty and creative candy! Finest milk chocolate that empathetically embraces an almond core and seems to never let it go again. That's what will happen to you when you try our CHOCO MILKY ALMONDS! There will be no way back. To celebrate that new love, take them out of the bag, put them in a whiskey glass and place it on your coffee table to show them off to your friends. Or, even better, take them to bed as a bedtime treat - they will tenderly take you to chocolate dream land!